Is there anything more lovely than the sounds of bird songs early in the morning or the sight of a hummingbird fluttering at your windowpane? If you treasure your garden, if you’re most at home in nature, if you’re an animal lover or if you just can’t wake up without the sounds of springtime, CJ Wildlife helps save the wildlife you love while keeping some of the savings for yourself with a CJ Wildlife discount code. On a farm in rural Shropshire in 1987, lifelong ornithologist and wildlife enthusiast Chris Whittles began researching the preferences and dietary requirements of wild birds in order to begin selling seeds. As the desire for a closer relationship with garden birds grew over the years among homeowners, gardeners, and wildlife lovers alike, CJ WildBird Foods Ltd. grew as well. As a result of extensive research and a scientifically based food development programme run by ornithologists, CJ Wildlife has pioneered a new range of wild bird food for purchase as the supply of bird food in the wild has been decreasing significantly. From 18 species of common songbirds receiving all of their sustenance from gardeners and homeowners when CJ Wildlife was founded in 1987 to more than 80 species feeding exclusively in gardens today, CJ Wildlife has not only grown to meet the new demand, but also begun a research initiative to establish the importance of year-round feeding for garden birds. Today CJ Wildlife is independently certified by the Forest Stewardship Council and the Rainforest Alliance in addition to working with wildlife organizations and charities throughout Europe to protect and sustain our wildlife. The CJ Wildlife team is made up of ornithologists, bird rangers, wildlife experts and bird enthusiasts all dedicated to protecting and preserving native birds; and, by shopping at CJ Wildlife, you can contribute to this incredible mission. Save some money as you save a life when you bring your CJ Wildlife discount code to the CJ Wildlife shop online. Start shopping at CJ Wildlife and comb through bird food, boxes and gifts for children until you’ve found just what you’re looking for. If you already have a CJ Wildlife account log in here, or click “Continue” to checkout as a new customer. Provide a little information about yourself and then update your billing address. If your order is a gift, you can fill out some information about the intended recipient before redeeming your CJ Wildlife discount code. Select your delivery address after entering your postcode and then choose how you’d like your order delivered before taking advantage of that CJ Wildlife discount code. Choose how you’d like to pay for your order and add the requisite information before applying your CJ Wildlife discount code. In the box labelled “Promotional code” enter your CJ Wildlife discount code and then select “Continue” to submit your order with your CJ Wildlife discount code savings applied. Discover all the incredible uses for your CJ Wildlife discount code by tuning in to the CJ Wildlife YouTube channel. Navigate to CJ Wildlife and search the incredible selection until you light upon something that meets your needs. Enter your personal details and your billing address before applying your CJ Wildlife discount code to this order. Choose your delivery address (if it is different from your billing address) and then select how you’d like your order shipped before using up your CJ Wildlife discount code. Select your payment method and update your card details with your CJ Wildlife discount code in hand. Before you finalize your order, enter your CJ Wildlife discount code in the box labelled “Promotional Code” and select “Continue” to submit your and contribute to the conservation of your local species. Orders under £50.00 are delivered for £2.75 per order with 1-4 working days. For orders over £50.00, CJ Wildlife offers free next day delivery. Saturday delivery service is offered for a charge of £4.20 if your order is under £50.00 or £1.45 if your order is over £50.00. If you need to return a product for any reason to CJ Wildlife, you can naturally do so. Simply contact CJ Wildlife with 14 days and arrange a refund or a replacement for your unwanted items. Don’t forget to check them often, as you can never be sure when a free CJ Wildlife Discount code might be waiting for you! 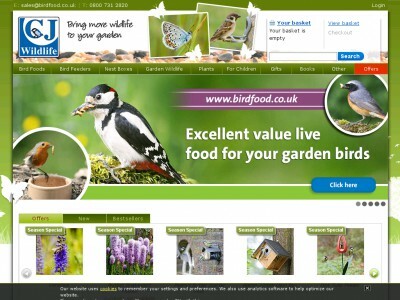 Buy now online at www.birdfood.co.uk. Inviting wildlife into your garden is a magical experience for everyone – and with a CJ Wildlife discount code it can be great value for money. At birdfood.co.uk they've got a fantastic selection of products designed to encourage birds and butterflies to live in your garden – all available at a great price with a CJ Wildlife discount code. I used my CJ Wildlife discount code to save money on garden explorer kits for the kids, but everything from feeders and nest boxes to seeds and plants can be purchased at a bargain price with a CJ Wildlife discount code.